Al Mar Shugoto 1 is mint with with original near mint black leather scabbard. Al Mar Shugoto 1 is mint with with original near mint black leather scabbard. The blade is 7" and it is 11-3/8" overall. It hasn't been carried, used or sharpened. Model 4004. The handle is Zytel with brass guard and the blade is 6A stainless steel and is RC 57-59. It comes with the original leather sheath that works for both left or right carry. The sheath has several light rubbed places and impressions and the snaps have some black paint coming off as can be seen in the photo. The sheath needs a good cleaning and black polish to look almost new. Get it before it is gone! Al Mar was working for an industrial design firm in Los Angeles in 1967. Gerber's first designer retired about this time and Al Mar joined Gerber Legendary Blades in 1967 or 68 (American Blade magazine Dec. 1976) after Pete Gerber gave Al the task of coming up with an aluminum handle for a kitchen knife. Pete Gerber thought the project was very successful and offered Al the position of design chief. 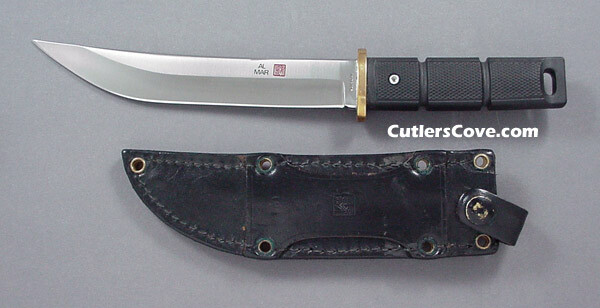 Did you know that Al is credited with designing the Gerber Mark I. He left Gerber in 1979 to start Al Mar Knives and he died in October of 1992. Al was 54 years old. The new owners have now discontinued most of the original models and moved to other makers on the remaining models. This leaves the knives made while Al was in control of the company very desirable and collectible! Mar is Chinese for horse. Chinese and English translation from old Al Mar knife box.